As the old saying goes "An economic super power needs a strong and efficient maritime transport". 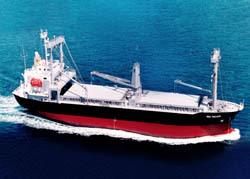 Sang Thai Group is the largest wholly-Thai owned conventional shipping carrier. Established 38 years ago, it already takes the front row of the country's billions-of-baht shipping industry. Sang Thai Group has 9 subsidiaries and operate a strong fleet of 6 vessels having total capacity of 54,898.49 deadweight tonnes. Its network covers the countries in Far East and Southeast Asia. In an effort to keep up with Thailand's booming business, it is considering to diversify to containerized transport in the future, a promising plan for its reliable service. 1. 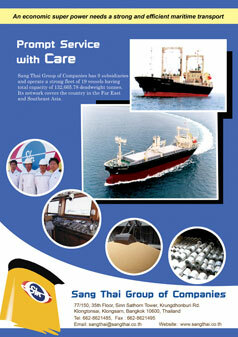 Sang Thai Shipping Co.,Ltd. 2. Sang Thai Navigation 1977 Co.,Ltd. 7. S. Carrier 2000 Co.,Ltd. 8. S. Seagoing 2002 Co.,Ltd. 9. Sang Thai Transport Co.,Ltd.